THIS LOTTERY IS SPONSORED BY THE CANADIAN GOVERNMENT FOR THE PROMOTION OF THE 2010 WORLD CUP TO BE HOSTED IN SOUTH AFRICA. We happily announce to you the draw of the Euro-Afro-American Sweepstake Lottery International programs held on the wed January 03 2007 in Essex United Kingdom and Canada Your e-mail address attached to ticket number:B9564 75604545 100 with! Serial number 46560 drew the winning numbers 4/14/17/20/38/48 with a bonus Number 7,for LOTTO 6/49 under the choice of the lottery in the 2nd category of daily three. You have therefore been approved to claim a total sum of US$1.000.000.00 (One Million United States Dollars) in cash credited to file EAAL/9080118308/04. 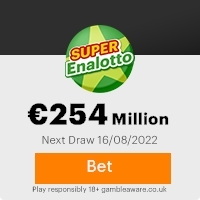 This is from a total cash prize of US $130,000,000.00 Million dollars, shared amongst the first One-Hundred and thirty (130) lucky winners in this category worldwide. Please note that your lucky winning number falls within our Afro booklet representative office in Africa as indicated in your play coupon, because this particular draw was selected to promote the 2010 World Cup to be Hosted in South Africa hence your winning information must be kept to enable you participate in our subsequent games before the grand finale. In view of this, your US$1.000,000.00 (One Million United States Dollars) would be released to you by an accredited commercial Bank in South Africa. Our African agent will immediately commence the process to facilitate the release of your funds as soon as you contact him. All participants were selected randomly from World Wide Web site through computer draws system and extracted from over 10,000,00 companies and personal e-mails. MR. BILLY NKOSI, Tel: +27-78-170-1413. Mrs.Gladys Owen United Kingdom Zonal Co-coordinator Mrs.Patricia Hope Asst. Gen. Sec Mr. Grey Johnson Canadian/American Zonal Secretary General. Switzerland Zonal Co-coordinator For African Winners Dr Bill Wilson. African/European Head Office Baumgarten-strasse 15 Postfach 686 Geneva CH-8201 Schaffhausen Dr Peter Martins Head South African Offshore Payment Office Madrid, Spain. (www.canada.com/findit/lotteries/index.html) Check for LOTTO 6/49. Previous: YOUR EMAIL HAVE WON!!! ... FFICEFresh ScamsNext: YOUR E-MAIL WON!!! This Email with the Subject "" YOU HAVE WON SOUTH AFRICA 2010 WORLD CUP SPONSORED BY CANADIAN EMAIL LOTTERY" was received in one of Scamdex's honeypot email accounts on Thu, 19 Apr 2007 04:14:45 -0700 and has been classified as a Generic Scam Email. The sender shows as "SOUTH AFRICA 2010 WORLD CUP SPONSORED BY CANADIAN EMAIL LOTTERY" <canadianinter_lot0521@hotmail.com>, although that address was probably spoofed. We recommend that you do not attempt to contact any persons or organizations referenced in this email, as you may expose yourself to scammers and, at the very least, you will be added to their email address lists for spam purposes.